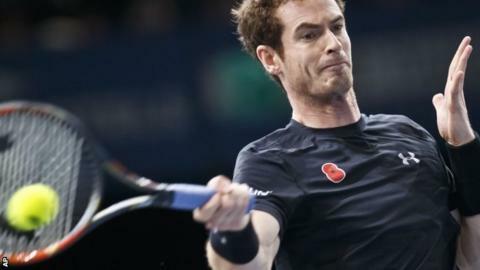 Britain's Andy Murray reached the Paris Masters semi-finals for the first time with a three-set victory over French 10th seed Richard Gasquet. Second seed Murray came from a break down in the final set to win 7-6 (9-7) 3-6 6-3 in two hours and 38 minutes. "It was a tough match," said the Scot, 28, who plays David Ferrer in his semi-final after the Spaniard beat American John Isner 6-3 6-7 (6-8) 6-2. World number one Novak Djokovic saw off Tomas Berdych 7-6 (7-3) 7-6 (10-8). Murray faces a challenging end to the season, with the ATP Finals in London only nine days away, followed by Britain's first Davis Cup final since 1978, which gets under way in Belgium in three weeks' time. Murray had lost just four games in winning his opening two matches in Paris, but was given a far sterner test by Gasquet - and it took its toll. "I got a little stiff in my lower back," the Briton said afterwards. Murray had toyed with the idea of skipping the ATP Finals - and risking the wrath of the governing body - in order to arrive in Belgium fresh for the Davis Cup final, his primary focus for the rest of the season. However, that scenario appears less likely now and, asked if his back was a concern, Murray told Sky Sports: "I don't think so. I was moving well, it was just on the serve it gave me a little bit of trouble. That can happen, it's a long season. "After a couple of weeks it's maybe normal to feel a little bit stiff and sore and maybe it's a good thing, to get that out of my system. "The crowd was behind him and it was perfect preparation for the Davis Cup, in an atmosphere like that." Murray's immediate focus remains the Paris Masters, and a real chance to make an impact at a tournament which has yet to see the best of him. Gasquet had inflicted one of five previous quarter-final defeats on Murray, back in 2007, and the 29-year-old played well enough to threaten a repeat on Friday. In a high-quality match, Murray edged the first set in a tie-break but made little impact on the Gasquet serve in the second, the Frenchman taking it thanks to one break. When he moved a break up early in the third it appeared that Gasquet was on course to claim his first win over Murray since 2012, but the Scot hit back immediately and made the decisive breakthrough with a drop shot at 4-3. Defending champion Djokovic saved set points in both sets to claim his 20th consecutive win and remained on course for an unprecedented third Paris Masters title in a row. The 28-year-old top-ranked Serb secured a hard-fought victory in two hours seven minutes and in the semi-finals will play Stanislas Wawrinka who defeated Rafael Nadal of Spain 7-6 (8-6) 7-6 (7-5). It was a third win in four matches for the Swiss after he lost the first 12 matches between the pair.